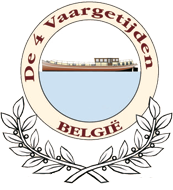 Original use: The barge “De 4 Vaargetijden” started its career in 1924 as a barge for freight. For more than 50 years it was used mainly for transporting sand and gravel. Taking 184 tons of freight per trip, the ship’s owning family earned good money. Since 1998: after complete renovation, main purpose of the ship is to carry passengers. The metamorphosis of the cargo space resulted in 4 comfortable cabins each fully equipped and with private facilities. Combined with a cosy dining and living room the ship offers all modern comfort for up to 8 passengers. Should we mention that the ship itself is compliant with all legal security and safety regulations? Just take a seat and look at the countryside gliding along in ever-changing views. Stops can be made on most places whenever you want to discover the mainland. Your host family intends to offer you a perfect journey: both have proved skils as Captain, Cook and are available as a source for tourist information.